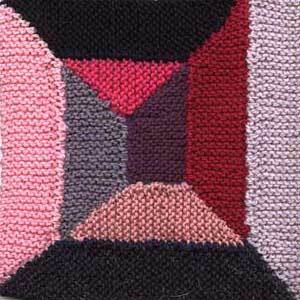 I used approximately 45gm of scraps of 8 ply wool in different shades of purple, blue and pink. 20sts and 40 rows to 4 inches (10cm) over garter st on 4.5mm needles, or needles needed to obtain gauge. WT = Wrap and turn: K to the point where your pattern says to turn but don’t turn the work yet. Sl the st back to the left hand needle. Put the needle up through the wrap on the right side of the work, put the needle through the st and K the two together. Beginning at centre, cast on 9 sts and knit 18 rows. ** Repeat from * to ** once more. K to 2nd last st, slip one, pick up st at bump formed on the edge of previous section , pass slipped st over. If you find this awkward you can sew the seams after you finish knitting. Now, back to the pattern! K16 rows, turn corner as before. Sew seams if necessary and block.